With the fall of France in May 1940, after the German Blitzkrieg invasion, all British Army Expeditionary Force (BEF) tanks and vehicles had to be left behind as the soldiers escaped back to England via the beaches of Dunkirk. When the vehicles were abandoned the British troops tried to make them unusable so the German Army could not turn them against their previous owners. Not all their efforts were successful. A number of the captured tanks were in a repairable condition. Parts were taken from different vehicles to make one vehicle serviceable. The German mechanics managed to repair a number of British Vickers Mk.VIb and Mk.VIc light tanks. 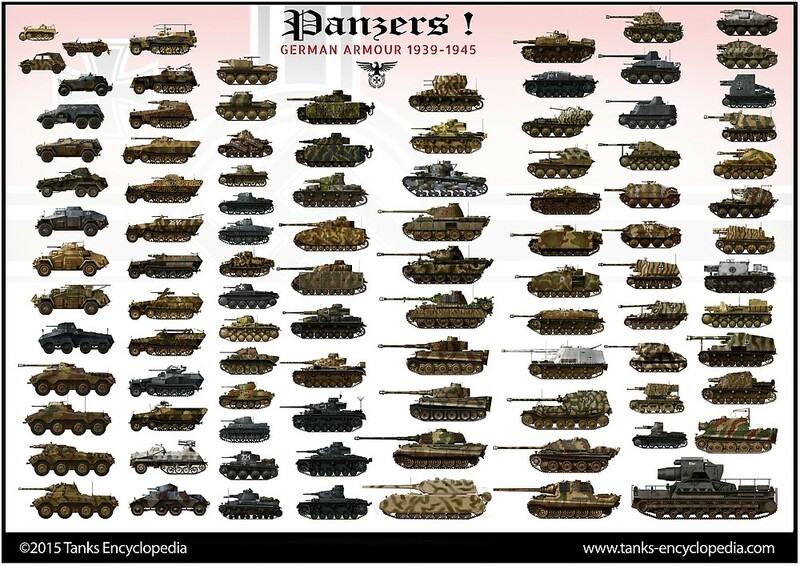 These were known as Beutepanzers (trophy tanks) and given the official designation of Leichter Panzerkampfwagen Mk.VIB 735(e) or Leichter Panzerkampfwagen Mk.VIC 736(e). They were used for combat, reconnaissance, internal police security and tank crew training. The letter ‘e’ in brackets referred to the country of origin of the captured tank, in this case, England. 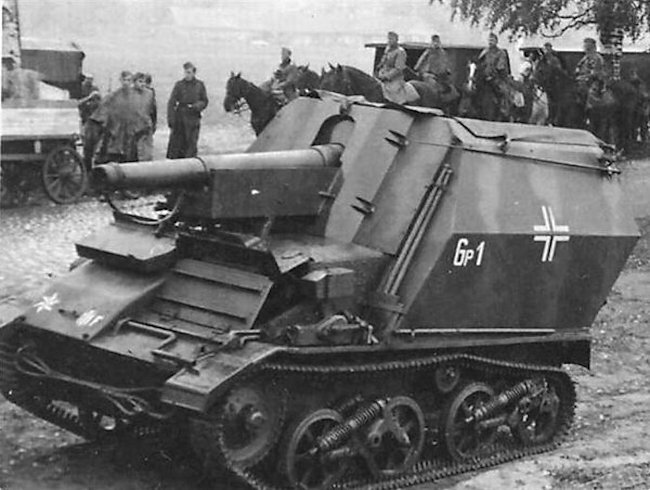 The German army needed artillery that could keep up with the tanks of the Panzer Division. A decision was made to use some of the captured tanks, including the Vickers Mk.VI light tanks, as self-propelled artillery guns and mount a howitzer on the tank chassis. A German engineer called Oberleutnant Becker, who had been attached to the tank producing factory of Alkett in Berlin, organized the mounting of six WW1 era 10.5cm le.F.H.16 howitzers on the top of captured Vickers Mk.VI tanks. The gun crewmen were protected by an armored casement that surrounded the 10.5cm leFH 16 howitzer. Its armor thickness ranged from 11 to 22 mm (0.43-0.89 in). That was enough to protect the crew from small arms fire and shrapnel fragments from high explosive shells and mortar rounds. 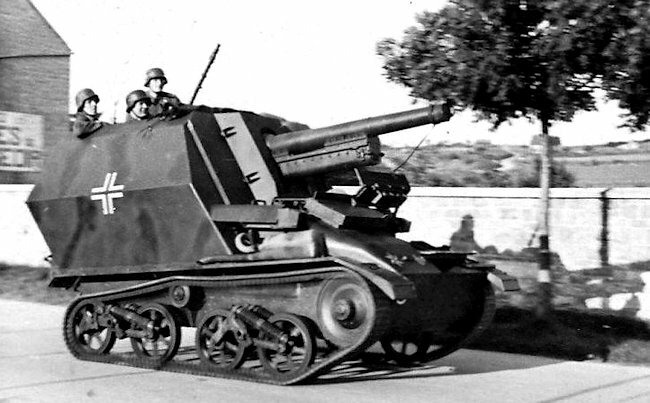 This self-propelled gun was not designed to fight on the front line. It was an artillery self-propelled gun that would stay behind the main assault and fire high explosive HE shells over the heads of the troops and tanks at targets given to it as grid references on a map by forward observers. 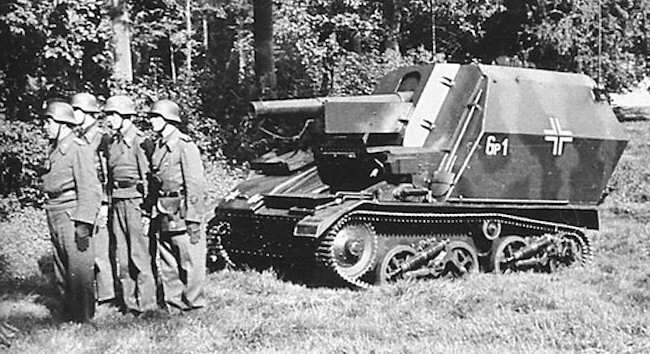 It was not an anti-tank gun, though it did carry a few armor piercing AP rounds for self-defense at close quarters. A machine gun could be fitted to the front of the superstructure to the right of the gun. The crew had their own weapons that they could fire over the top of the fighting compartment if enemy troops got too close. The fighting compartment was open topped, it did not have an armored roof. This kept the weight down and gave the commander all round vision. The crew would cover the top with a tarpaulin in bad weather and also in very hot weather, in order to provide shade. To help deal with recoil from the gun when it was fired, the gun crew deployed a metal support frame attached to the rear of the vehicle. It was a square shaped metal frame that was strengthened by two cross bars and at the bottom had V-shaped ‘spades’ at the bottom that would dig into the earth. 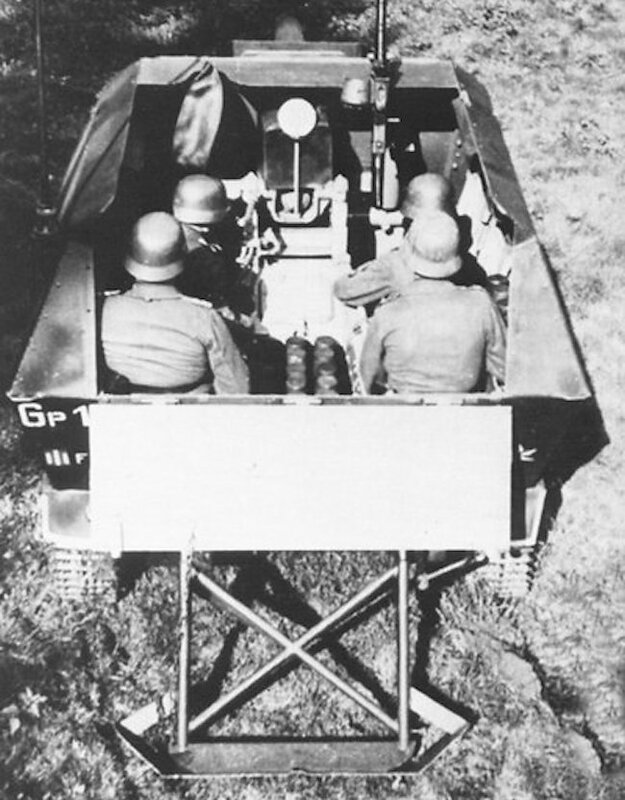 The commander sat at the rear of the vehicle, on the left side, behind the gunner. 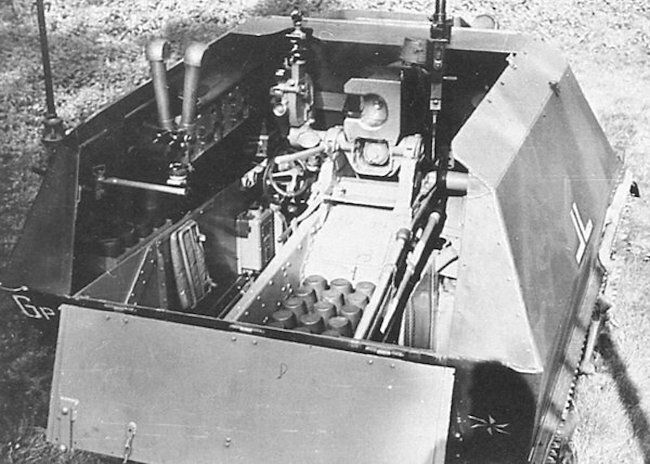 He had access to a range finding periscope mounted to the side of the vehicle. The gunner’s gun sight poked out above the top of the forward gun shield and armor casement. The loader sat on the right side of the vehicle. The 10.5 cm leFH 16 gun was a German light howitzer used in World War I. It had a shorter range than the WW2 10.5 cm leFH 18 gun. Its maximum firing range was 9,225 m (10,089 yds). As it had the same caliber as the newer leFH 18, it could fire the same ammunition. Its muzzle velocity was 395 m/s (1,300 ft/s). 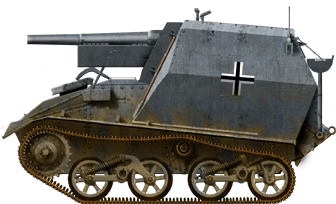 The 10.5 cm leFH 16 gun abbreviation leFH stands for the German words ‘leichte FeldHaubitze’ which, translated, means light field howitzer. It was not fitted with a ‘Mundungbremse’ muzzle brake. 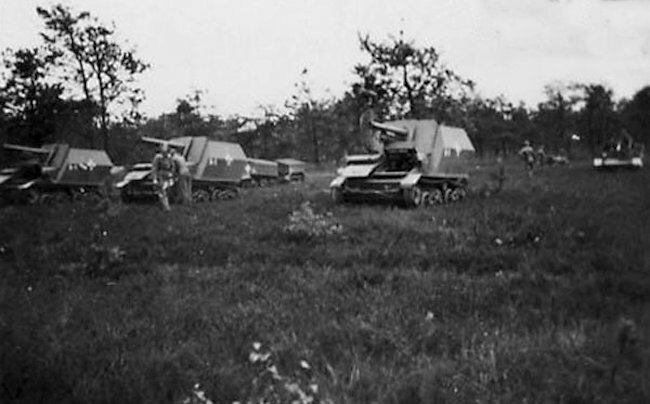 The six converted Vickers Mk.IV light tanks, now fitted with the long range 10.5cm leFH 16 artillery howitzer, were placed in the 15th battery of the Artillery Regiment, 227th Infantry Division. They were divided up into two platoons of three. The commanding officer was the same German Engineer Alfred Becker, now promoted to Captain, who had been involved in their construction. The German documents refer to this unit as an assault battery. It was not used in that role. The armor on the front of these vehicles was not strong enough to take a direct hit from an enemy tank or anti-tank gun. These SPGs were used as artillery. The 227th Infantry Division performed coastal defense and internal occupation security duties after the fall of France in Normandy, near the port of Le Havre, from July 1940 until late summer of 1941. The gun crews had time to train on their new vehicle before being posted to the Eastern Front and taking part in the heavy fighting in and around Leningrad (St Petersburg) Russia. The 227th Infantry Division was transferred to the German Army Group North, arriving in the autumn. They relieved the 39th Motorised Corps who had been in position in the forests south of Ladoga. At this part of the battle, the German commanders were expecting a Soviet counter attack to try and end the siege surrounding the city. 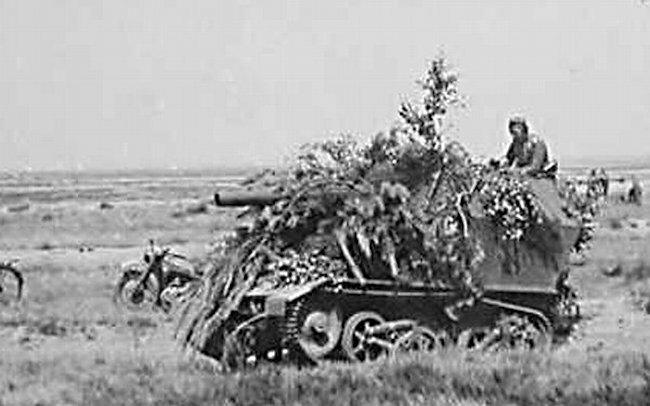 The 10.5cm LeFH 16 auf Geschutzwagen Mk.VI(e) artillery SPGs of the 15th Battery took up defensive positions where they could fire on the routes it was believed the Red Army troops and tanks would take. They had time to zero in their guns, so as soon as the advancing Soviet forces were spotted by forward observers, they could cover the area in high explosive HE shells. They were temporarily transferred to the nearby 254th Infantry Division and provided mobile artillery support when they took part in the 54th Army’s offensive of the 20th October 1941. 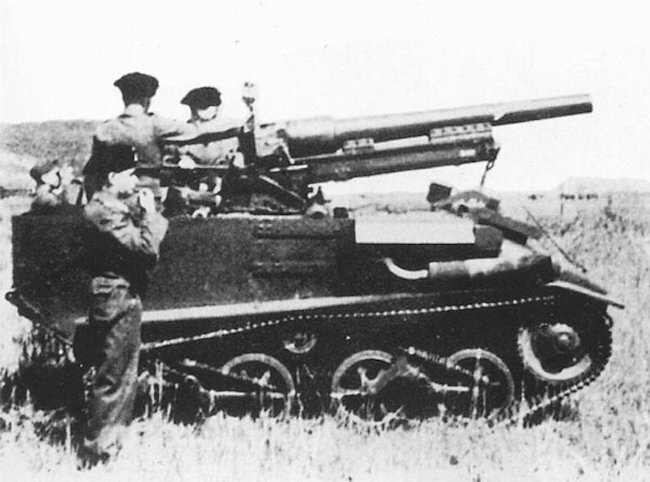 The 10.5cm LeFH 16 auf GW Mk.VI(e) were used for numerous artillery fire missions between the 23rd and 24th October 1941, firing over 200 rounds. It appears that the 15th Battery was now divided into three platoons of two guns each. The unit suffered its first casualties. Four men including Captain Becker were wounded when the SPGs were used for direct fire infantry support. This was a role not suitable for this artillery weapon due to the lack of heavy protective armor on these vehicles. 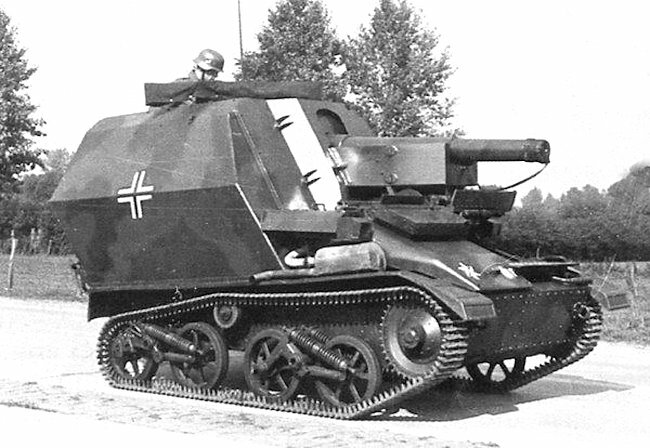 The two 10.5cm LeFH 16 auf Geschutzwagen Mk.VI(e) artillery SPGs of the 1st platoon were very active in late October. They were ordered to support the 11th Infantry Division as they attacked towards the villages of Volkhov and Pogostye. Soviet infantry surrounded the SPGs and the tank crews had to use their personal weapons and hand grenades to fight off the enemy troops. On the 11th of November 1941, near the village of Khotovskaya Gorka, Soviet light tanks engaged the 1st Platoon Artillery SPGs. A German battle report confirmed the Soviet report that one of the vehicles was hit 16 times, but its armor was never penetrated. The tanks they confronted were Soviet T-40 light tanks of the 2nd Tank Brigade. 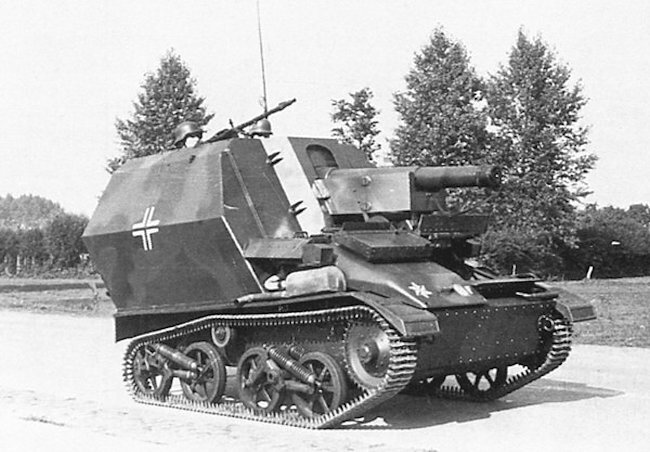 Luckily for the German gun crews, the T-40 was only armed with machine guns. Three men were killed on 15 November when the battery was ordered to act as assault guns whilst supporting an unsuccessful attack of the 223rd Infantry Division. One of the vehicles had to be left in no man’s land after being heavily damaged by a mine. It was recovered three days later. The 15th Battery had fired over 1300 shells, which is just over 200 shells per gun crew, between November to mid-December 1941. The 15th Battery conducted more artillery support fire missions during the winter and spring of 1942 as the 227th infantry Division continued to fight around the village of Pogostye. Three of the six 10.5cm LeFH 16 auf Geschutzwagen Mk.VI(e) SPGs were knocked out on the 16th of February 1942, when KV-1 heavy tanks of the 124th tank battalion of the Soviet 54th Army attacked German units. The 10.5cm armor piercing ammunition given to the German gun crews failed to knock out the Red Army KV-1 tanks. 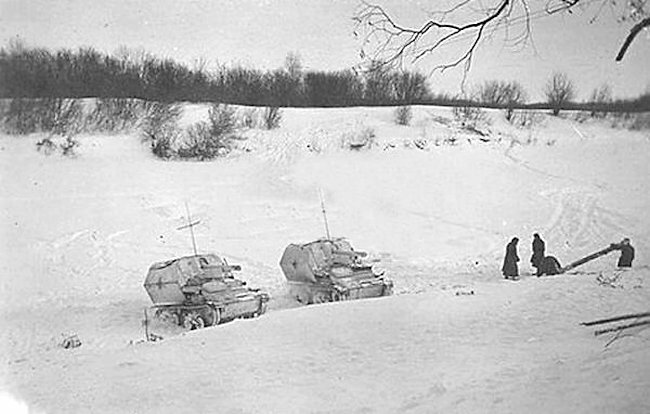 The three remaining vehicles provided close support as troops moved through forest roads near Pogostyle in March 1942. They used their HE shells to destroy a machine gun nest and fire on a Soviet infantry column they encountered in the woods. One of the remaining three vehicles was reported not fit or active service and could not be repaired after the close quarters fighting during March. The 15th Battery now only had two vehicles. They were used to break through an enemy encirclement. One was knocked out by a Soviet anti-tank rifle. 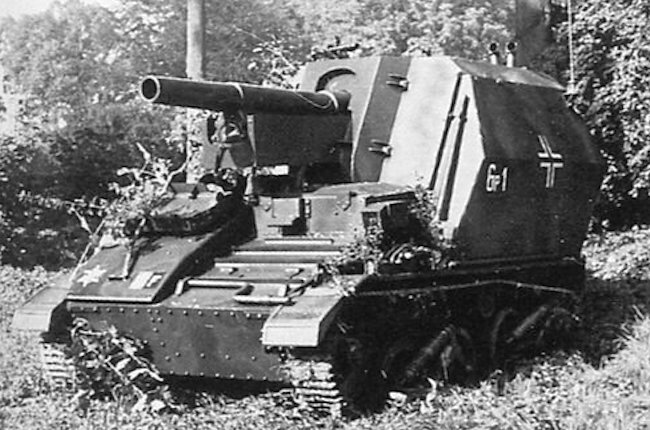 The last remaining 10.5cm LeFH 16 auf GW Mk.VI(e) self-propelled gun was destroyed by a Red Army tank of the 98th Tank Brigade as it tried to provide protective covering fire for one of the German supply routes. A German Army post-battle report dated November 1941 covered the role played by the 15th Batterie, Artillerie-Regiment 227 assault gun battery in the battle of Leningrad (St Petersburg) in October 1941 near the village of Mga south of the city. The reporting officer was impressed with the high explosive shell performance of the 10.5cm LeFH 16 howitzer over the 7.5 cm HE shells. He judged it to be three times as powerful. It was found that the two-part ammunition used on the larger more modern guns, the 10.5cm LeFH 18, could be used up to canister charge 5. This helped in dealing with the logistics of ammunition supplies. The overall evaluation of the 10.5cm LeFH 16 auf GW Mk.VI(e) in combat was positive as it was a good stable firing platform and it had good cross-country performance. Because of these findings, more self-propelled artillery guns were built although on different larger tank chassis. On some photographs taken of 10.5cm LeFH 16 auf GW Mk.VI(e) on the Eastern Front there are numbers and letters on the side of the vehicle. 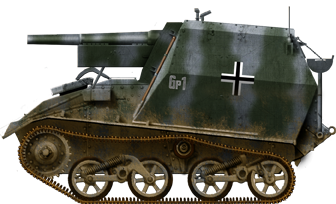 The letters ‘Gp’ are an abbreviation for the word ‘Geschuetzpanzer’ which translated as gun tank or self-propelled gun. The number is the vehicle identification number given to the vehicle by the Regiment: Gp 4 would be gun tank number 4 in an artillery battery of 6 vehicles. Tanks Encyclopedia’s own illustrations of the 10.5cm LeFH 16 auf Geschutzwagen Mk.VI(e) by David Bocquelet. There looks to be a machine gun mount at the front of the casement walls on the right of the main gun. The driver would sit behind the loader on the right at the back when the gun was fired to assist with loading the gun. A battery of three 10.5cm LeFH 16 auf Geschutzwagen Mk.VI(e) SPGs deployed for a fire mission. Notice the tracked ammunition carrier with a trailer in the background. 10.5cm LeFH 16 auf Geschutzwagen Mk.VI(e) SPG in winter camouflage. Two 10.5cm LeFH 16 auf Geschutzwagen Mk.VI(e) SPGs in a revers slope firing position to avoid detection from the Soviet troops. I don’t mean to be overly inquisitive, but what happened to the illustrations? Our resident Illustrator is taking a will earned break. But fear not, upon his return missing illustrations will be added. I’ve also heard sbout a variant with a 15 cm sFH 13. Was this real or is it simply a misconception?